It’s likely many fans of the Civilization series were ecstatic to hear that Firaxis would be releasing an expansion for last year’s Civilization VI. This was to be expected, though, taking into account that the earlier Civilization V got two big expansions, and so did its predecessor Civilization IV. And while you might think that Civilization VI is already bursting with features and offers plenty of gameplay possibilities for fans of strategy games, the Rise and Fall expansion does bring some interesting new gameplay concepts to the series, meaning it might make Civilization VI feel fresh again when it’s released next month. This expansion also adds several new civilizations (civs for short) to the mix, and the latest of these to be announced by Firaxis is the Cree. 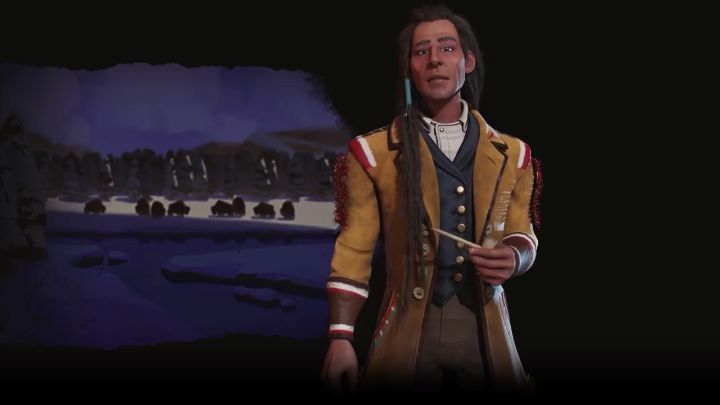 This was a native American tribe which flourished in North America in the 18th century, and you’ll be able to take control of them, playing as their leader Poundmaker in Civilization VI if you get the Rise and Fall expansion for the game. One of the key advantages of the Cree is that they can gain territory quickly early in the game. This is because the Cree’s trader units can claim map tiles within 3 tiles of a Cree city when they first move into them, while you also get your first trade route after researching pottery. Your early expansion will also be aided by the Cree’s special unit, which is a better than the standard scout it replaces as Firaxis explains in the video below. Later in the game the Cree also get bonuses when establishing trade routes with other civs, as doing so grants them additional food if the destination city has a camp or pasture. This is only the case if you’re in an alliance with that civ, something that’s definitely worth pursuing as the Cree gain shared visibility when they are in an alliance with another nation in the game. Also, this civ’s unique building (the Mekewap) grants them extra gold if placed next to a tile with a luxury resource and extra food if situated next to bonus resources, meaning you might enjoy playing as the Cree if you’re the sort of player who wants to gain an advantage through economy and trade in a game of Civilization. It remains to be seen, though, whether playing as the Cree will be as much fun as playing as other civs in the game or whether the additions featured in Rise and Fall really improve the core Civilization VI experience, something we’ll find out when this expansion is released next month. Note: Civilization VI: Rise and Fall will be released on February 8, 2017. Available on PC.